Maptek is a renowned and leading global IT firm offering Web services and solutions to clients around the world. We offer a complete range of uncompromising quality and value added IT products and services. In addition to this, end-to-end solutions by engaging industry experts and cutting edge technologies are what we look forward to. We are located at Thane, Mumbai, Maharashtra, India. 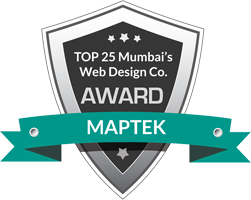 Maptek is the ideal provider for solutions in Website development , Application development & maintenance , Mobile Application development, Mobile website development and Search Engine Optimization services. Our aim is to deliver optimal solutions that help our customers achieve their business goals. Our management team has more than 15 years of experience. We help companies to achieve synergy between business and IT goals. We continuously invest in new technologies, processes and people to help our customers to stay ahead of competition and achieve their goals.